There seems to be no limit to the number of musical events taking place over the Sukkot holiday in Israel. The following is a brief list. There seems to be no limit to the number of musical events taking place over the Sukkot holiday in Israel. Schools, public institutions and many businesses will be on vacation. The Israel Beat Jewish Music Podcast is Arutz Sheva's window into the Jewish and Israeli music scene. Many of the following events has been covered in the past and will be covered in future episodes. For the latest episode of the Israel Beat Jewish Music Podcast click here. The following is just a brief list of the many events taking place during the Sukkot holiday. The 2012 ProgStage festival will take place October 4th - 6th and will feature top name Israeli rock groups. The event will be held at Dugal beach at the Sea of Galilee (Lake Kinneret). Top rated Israeli band Orphaned Land will headline the festival. They are known for combining metal with Sephardic and Middle Eastern music. Foreign acts will include Osada Vida, The Flower Kings, Andromeda, and Pain of Salvation. Fourteen other Israeli bands will perform as well. The 4th annual RockAmi festival will feature top name Jewish musicians. Chaim David, Shlomo Katz and Soulfarm will perform over the Sukkot holiday. The event will take place on October 4th at the Beit Yehudit - The International Cultural Center For Youth in Jerusalem. All proceeds directly benefit the Lone Soldier Center in memory of Michael Levin. The center works with Israel Defense Force soldiers who moved to Israel alone without any family members in the country. For a past article about the RockAmi festival click here. 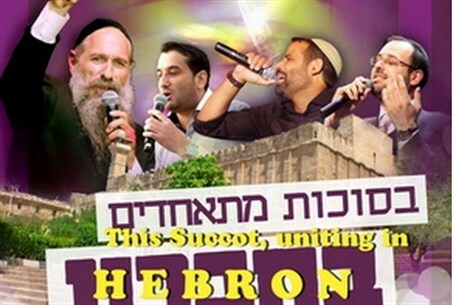 Two of the most popular musical acts on the Jewish music scene will perform in Jerusalem for a special benefit concert. Lipa Schmeltzer, known for his yeshivish style music and wacky and creative videos will perform alongside 8th Day, a Jewish pop / rock group. Popular Israeli singer Yishai Lapidot will be the opening act. Proceeds from the concert will benefit United Hatzalah, Israel's largest volunteer-based emergency medical technician service. The event will take place on the Sukkot holiday Oct. 6th at the Jerusalem Theater. The Beit El Heritage Center is hosting tours of the historic site of the Jacob's ladder dream. On a hilltop overlooking Beit El, a stone building approximately 1,000 years old stands on top a large natural bedrock. Judy Simon, host of Israel National Radio's "Life Lessons" and tourism coordinator for Beit El, will be conducting the visits in both English and Hebrew. For more information click here. The Derech Beit Lechem Bread Festival will take place in the Geulim neighborhood of Jerusalem. Also, known as Baka, the neighborhood features many historic Middle Eastern buildings. It's main thoroughfare, Bethlehem Street as the ancient route from Jerusalem to the city of Bethlehem and might remain so today if it didn't dead-end at the Talpiot Industrial Zone. Bethlehem Street will be closed starting at 5pm on Wednesday. Oct 3rd. Musical acts and arts and crafts will be available for children and adults including painting, dance and bread making. A sukkah on the street will be hosted by Rabbi Avraham and Dina Hendel of Beit Levi - Chabad of Baka. For coverage of last year's fair click here. The Hendels are also sponsoring a Sukkah party on Thursday with music and refreshments at the Baka Farm School on Yehuda Street. The school which teaches agriculture is also home to Yad Gedaliah, a social service organization set up in memory of Gedaliah Mellick, a fallen Israeli soldier. The bi-annual Moshav Country Fair will take place October 3rd at Moshav Me'Or Modi'im. The small agricultural community was founded by Rabbi Shlomo Carlebach in the 1970s. The event will take place during the holiday of Sukkot. Featured musicians will include Aryeh ben Chayim Guiloff, Baruch Shapiro, Yerachmiel Ziegler, Benyamin Steinberg, Shtar, Josh Laufer, BenZion Lehrer, Shlomo Katz, BenZion Solomon and Sons, Hamakor, Ktoret, Jah Levy, Shivi Keller and Aryeh Naftali and the Elevators. For coverage of the past fair click here. The Moishe House in Jerusalem will be sponsoring a sukkah party on October 5th featuring a musical jam session, a yoga class and guest speakers which will discuss Torah and spirituality. Moishe House is an international program that has opened locations around the world in which young Jewish activists live in a house and organized outreach activities and Shabbat dinners. The Jerusalem location opened up several months ago. The Tamar Festival in the Negev region will be hosting some of the most well known names in contemporary Israeli music. The musical performances will take place in nature reserves such as Wadi Zohar and at the foot of Mount Masada. Well known singers will include Gidi Gov, Yehuda Poliker, Yehudit Ravitz, Barry Sacharoff, Mashina Asaf Avidan and more. The festival lasts October 1st - October 4th. Zedekiahs Cave under the Old City of Jerusalem will host a Sukkot concert on Wednesday Oct 3rd. The ancient quarry in-between the Shchem Gate and the Flower Gate will reverberate with the sounds of the Razel Brothers, Aharon and Yonatan, who are known for their hassidic and pop style music, Chilik Frank and the Lev HaMaayan Band, known for their fast-paced danceable klezmer music, Chizki Sofer, who sings in the style of Rabbi Shlomo Carlebach and Yossi Schwartz and Elazar Winograd, two well know cantorial singers. The event is being sponsored by Ateret Cohanim. The annual Hevron music concert will once again take place outside the ancient Cave of Machpelach, where the tombs of the Jewish Patriarchs and Matriarchs rest. The event will be Wednesday October 3rd starting at 1:00 PM and feature Mordechai Ben David, the American Jewish singer who has been one of the most well known hasidic acts for decades. Also on the bill will be Haim Israel, Udi Davidi, Yeedle, Avi Gesner, Shlomo Katz, Ami Cohen and more. For coverage of last year's fstival click here. Ben Bresky is a music journalist living in Jerusalem. He hosts The Israel Beat Jewish Music Podcast interviewing a wide range of Jewish and Israeli musicians from Carlebach to klezmer, from hasidic to trance. For mp3 archives click here. For Facebook click here. For Twitter click here.